Sometimes I open the refrigerator, the star's align, angels sing, and I end up with something off-beat and special. No special trip to the store, and no over-thinking ingredient or flavor combinations. I like putting ingredients together in ways I've never tried before, and sometimes having limited choices is exactly the nudge I need in that direction. I think that's what happened here. I made this simple side dish the other night using everything on the left-hand, bottom shelf. It's asparagus tossed with a garlicky buttermilk dressing, perky radish sprouts, lots of fresh cilantro, and a handful of cooked posole. I had posole on hand, but beans (chickpeas? ), farro, orzo, or toasted nuts would be an easy swap if you don't. I should also mention its the sort of thing you can prep nearly 100% ahead of time. You can make the dressing a day or two prior to using. And you can cook, chill, dry, and refrigerate the asparagus in advance as well. 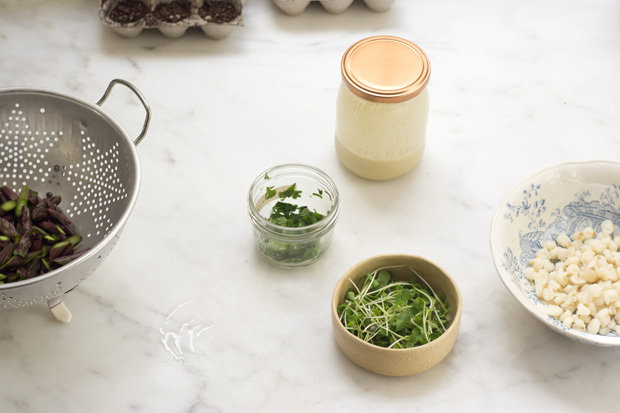 A few snips of sprouts and some cilantro, and you're all set. I use posole here, but understand not many of you keep it (cooked) on hand. I imagine (cooked) beans, farro, or orzo would be good substitutions! To make the dressing, combine the garlic and salt on a cutting board. Mash into a paste using the flat side of your knife. Place in a medium bowl or jar, then add the buttermilk and vinegar. Whisk together, then gradually whisk in the olive oil. Let sit while you make the rest of the components. You can saute or steam the asparagus. I used a simple basket steamer over a bit of water in a skillet. It might be easier for you to do a "steam-saute"....Start with a cold skillet. Add 1/4 cup / 60 ml water, a splash of olive oil, and a big pinch of salt. Bring to a simmer over medium high heat, add the asparagus, cover, cooking until the asparagus is just tender and bright in color, barely a minute. In either case, drain, then transfer to a cold water bath to stop the cooking. Set aside. 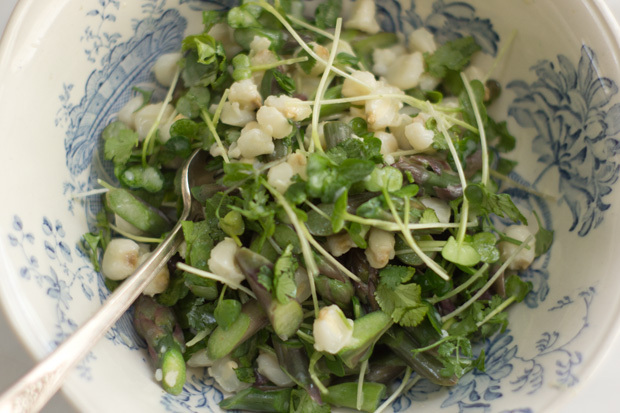 Just before you're ready to serve the salad, combine the asparagus, posole, cilantro, and sprouts in a large bowl. Coat generously with a splash of the buttermilk dressing, and toss well before serving. You'll likely have a bit of leftover dressing which can be used on vegetables, noodles, salads, and grains. One of the best salads I've made in a long time (mung bean sprouts, avocado, arugula, yogurt, almonds) & a look at the QUITOKEETO packaging. An excellent impromptu springtime lunch tartine: avocado smeared across toasted day-old slabs of sesame bread, layered with arugula and garlicky caraway asparagus + toasted pepitas.